Fish Mongers Horn  miniature version of the horn used by people selling fresh fish on the streets of our cities. They used the horn to attract potential buyers. Paul Revere Lantern  Pierced lanterns when illuminated with the candle light inside give a charming lace-like effect. 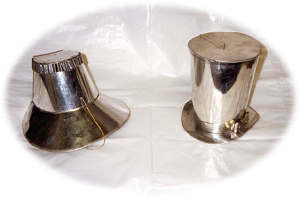 These lanterns were used largely when one was obliged to be about on evenings and they were carried close to the ground so that one could avoid puddles and rough places. 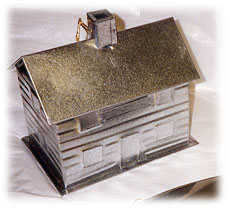 Tin Log Cabin  Tin Log Cabin. Tin Crumbler  A hostess always appreciates an efficient crumbler for the table. A clean crumb-free table cloth on celebration days is a must in a Pennsylvania German house. This artist is 92 years old and is a demonstrating craftsman at the Landis Valley museum in PA.
Yankee Doodle Cocked Hat  Wonderful cocked hat  This man is a tinsmith and is listed also as one of the Early American Life Craftsman. The inscription inside the hat is "dedicated to our first 'heads' of state." 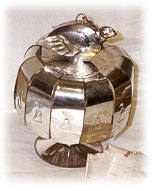 Tin Comb Holder Ornament  The original piece was found in Sandwich, NH. It was used to hold the curved tortoise shell combs in the hair by women of the period  circa 1850. Benjamin Franklin Sconce  This primitive sconce made out of 100 year old tin  is reproduced from a sconce which would have lit the way for Ben Franklin and others in the signing of the Declaration of Independence. Ten Year "Tin" Anniversary Gifts  These are a pair of novelty gifts given in the 19th century for ten year "tin" anniversaries. Great Item.